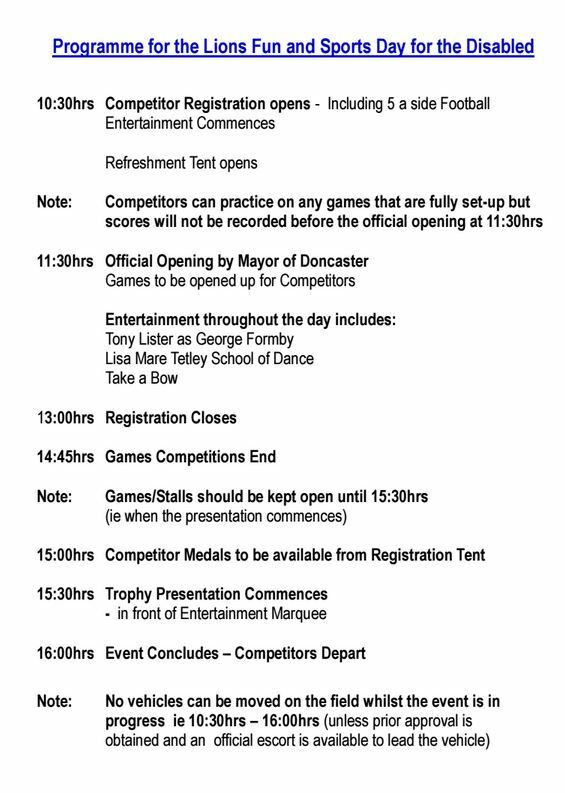 Below is the programme for this Saturdays Lion’s Fun and Sports day for the disabled. Always a favourite event in the park and this year will be no different. Be there or be square. 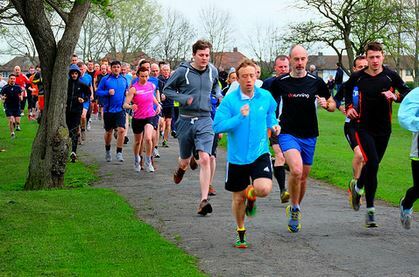 Not a Lot of People Know That……..
1,878 different people have now done the Doncaster parkrun, in Sandall Park, running 8,935 runs and covering a distance of 44,675km, that’s 27,759 miles. That’s more than travelling once around the world which is a mere 40,075km or 24,902 miles! 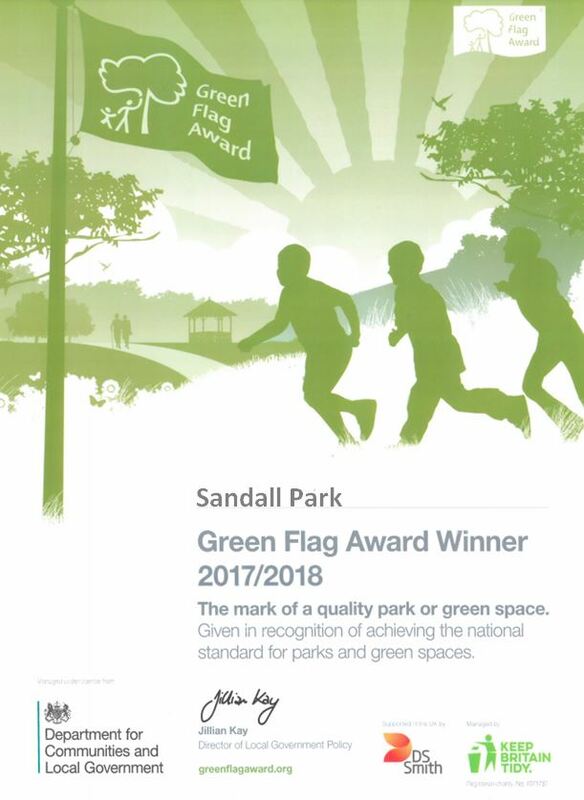 Congratulations to all parkrunners on breaking the record for runners at Sandall Park – a brilliant total of 169! That’s 92 weekly runs and never missing even one week. Great stuff from the volunteers too that keep making it happen week after week after week after week………. 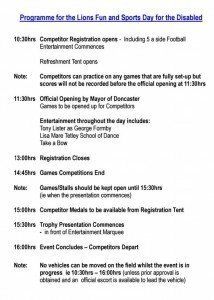 Proms on – Forecast Good! Proms concert is go! Forecast is OK all day – if a little breezy. Let’s go to the Proms. Anyone wishing to help us set up? We’ll be down by the lakeside from 10.30. Good luck too to all our junior Sandall Park football teams taking part in a mega tournament in the park today. WOW! !61 completed yesterdays parkrun…… almost the record… but not quite. The record of runners is 165 – so near yet so far! 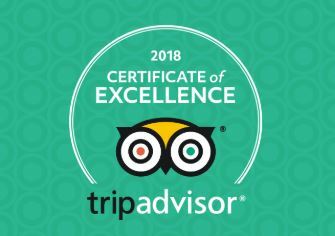 We WILL get there…… and well done the the volunteers who make it happen EVERY week. Parkrun – Great Turnout…. Again! Last Saturdays parkrun saw 122 complete the course. 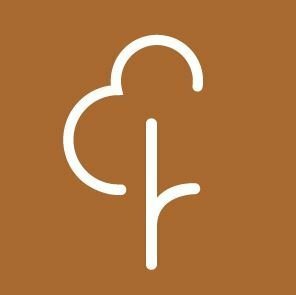 That is 88 consecutive parkrun’s in Sandall Park – and never missing a week! That is some dedication by both runners and especially the volunteers who make it happen. Great for the park and great for the soul!